OpenFlow is a vendor-neutral standard communications interface defined to enable interaction between the control and forwarding layers of an SDN architecture. The OpenFlow plugin project intends to develop a plugin to support implementations of the OpenFlow specification as it develops and evolves. Specifically the project has developed a plugin aiming to support OpenFlow 1.0 and 1.3.x. It can be extended to add support for subsequent OpenFlow specifications. The plugin is based on the Model Driven Service Abstraction Layer (MD-SAL) architecture (https://wiki.opendaylight.org/view/OpenDaylight_Controller:MD-SAL). This new OpenFlow 1.0/1.3 MD-SAL based plugin is distinct from the old OpenFlow 1.0 plugin which was based on the API driven SAL (AD-SAL) architecture. Mapping function(Infrastructure to OF structures). Connection establishment will be handled by OpenFlow library using opensource netty.io library. Event handling and propagation to upper layers. Plugin will support both MD-SAL and Hard SAL. Will be backward compatible with OF 1.0. New OF plugin bundle will support both OF 1.0 and OF 1.3. Integration with corresponding MD-SAL infrastructure. Hard SAL will be supported as adapter on top of MD-SAL plugin. OF 1.3 and OF 1.0 plugin will be integrated as single bundle. It is strongly recommended that any production deployments utilising the OpenFlow Plugin do so with TLS encryption to protect against various man-in-the-middle attacks. Please refer to the Certificate Management section of the user guide for more details. TLS Support in the OpenFlow Plugin is outlined on this wiki page. The baseline model is a OF 1.3 model, and the coverage tables primarily deal with OF 1.3. However for OF 1.0, we have a column to indicate either N/A if it doesn’t apply, or whether its been confirmed working. OF 1.0 is being considered as a switch with: * 1 Table * 0 Groups * 0 Meters * 1 Instruction (Apply Actions) * and a limited vocabulary of matches and actions. There are all helium features (from features-openflowplugin) duplicated into features-openflowplugin-li. The duplicates got suffix -li and provide Lithium codebase functionality. In case topology is required then the first one should be installed. In order for topology to work (fill dataStore/operational with links) there must be LLDP responses delivered back to controller. This requires table-miss-entries. Table-miss-entry is a flow in table.id=0 with low priority, empty match and one output action = send to controller. Having this flow installed on every node will enable for gathering and exporting links between nodes into dataStore/operational. This is done if you use for example l2 switch application. Download Mininet VM Upgraded to OF 1.3 (or the newer mininet-2.1.0 with OVS-2.0 that works with VMware Player. For using this on VirtualBox, import this to VMware Player and then export the .vmdk ) or you could build one yourself Openflow Protocol Library:OpenVirtualSwitch[Instructions for setting up Mininet with OF 1.3]. At this point you should have two interfaces one which gives you NATed access to the internet and another that gives you access between your mac and the VMs. At least for me, the NATed interface gets a 10.0.2.x address and the host-only interface gets a 192.168.56.x address. This will leave you sshed into a fully provisioned Ubuntu Trusty box with mininet-2.1.0 and OVS 2.0 patches to work with OF 1.3. Latest version of Openvswitch (v2.0.0) doesn’t support all the openflow 1.3 features, e.g group multipart statistics request. Alternate options is CPqD Openflow 1.3 soft switch, It supports most of the openflow 1.3 features. ethX should not be associated with ip address and ipv6 should be disabled on it. If you are installing the switch on your local machine, you can use following command (for Ubuntu) to create virtual interface. ethX - Any existing interface. 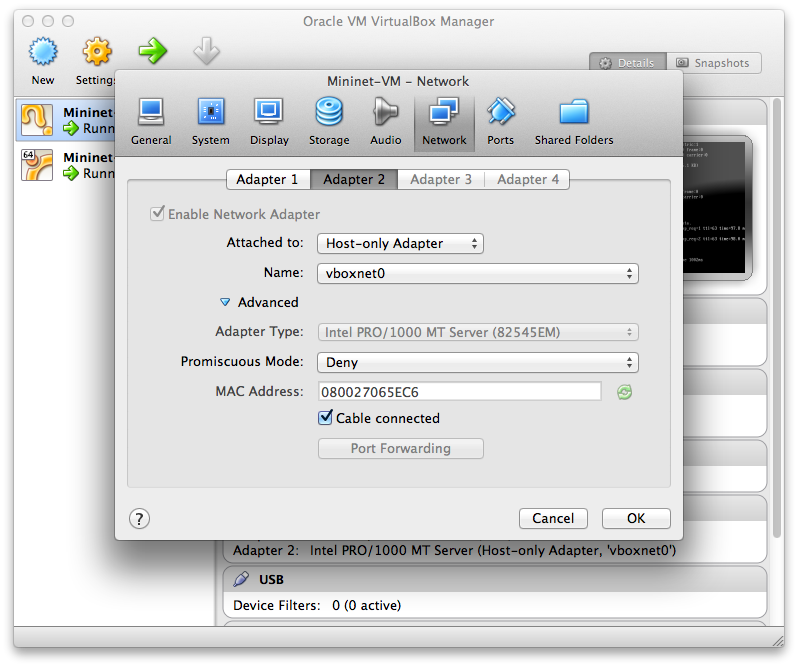 Or if you are using mininet VM for installing this switch, you can simply add one more adaptor to your VM. “dpctl” –help is not very intuitive, so please keep adding any new command you figured out while your experiment with the switch. Mininet comes with pre-installed Wireshark, but for some reason it does not include the Openflow protocol dissector. You may want to get and install it in the /.wireshark/plugins/ directory. The -X option in ssh will enable x-session over ssh so that the wireshark window can be shown on your host machine’s display. when prompted, enter the password (mininet). The wireshark window should show up. Start the capture on any port. but you would also need to update the 20 and 2 in the body of the XML. Other caveat, we have a known bug with updates, so please only write to a given flow id and table id on a given node once at this time until we resolve it. Or you can use the DELETE method with the same URL in PostMan to delete the flow information on switch and controller cache. If you want to see the above information from the mininet prompt - use “sh” instead of “sudo” i.e. use “sh ovs-ofctl -O OpenFlow13 dump-flows s1”. Currently, the openflowplugin has a test-provider that allows you to push various flows through the system from the OSGI command line. Once those flows have been pushed through, you can see them as examples and then use them to see in the config what a particular flow example looks like. Point your mininet at the controller as described above. Where # is a number between 1 and 80. This will create one of 80 possible flows. You can go confirm they were created on the switch. Note: You may have to trim out some of the sections like that contain bitfields and binary types that are not correctly modeled. Note: Before attempting to PUT a flow you have created via addMDFlow, please change its URL and body to, for example, use table 1 instead of table 2 or another Flow Id, so you don’t collide. Note: There are several test command providers and the one handling flows is OpenflowpluginTestCommandProvider. Methods, which can be use as commands in OSGI-console have prefix _. Examples for XML for various flow matches, instructions & actions can be found in following section here. The purpose of this page is to walk you through how to see the Topology Manager working end to end with the openflowplugin using OpenFlow 1.3. Use RESTCONF to see the topology information. For testing group feature please use for example CPQD virtual switch in the End to End Inventory section. If you want to try a different group id, make sure the URL and the body stay in sync. For example, if you wanted to try: group-id 20 you’d change the URL to “http://<ip-address>:8080/restconf/config/opendaylight-inventory:nodes/node/openflow:1/group/20” but you would also need to update the <group-id>20</group-id> in the body to match. <ip-address> :Provide the IP Address of the machine on which the controller is running. Note: <ip-address> :Provide the IP Address of the machine on which the controller is running. Currently, the openflowplugin has a test-provider that allows you to push various groups through the system from the OSGI command line. Once those groups have been pushed through, you can see them as examples and then use them to see in the config what a particular group example looks like. Point your CPqD at the controller as described above. This will install a group in the switch. You can check whether the group is installed or not. Before attempting to PUT a group you have created via addGroup, please change its URL and body to, for example, use group 1 instead of group 2 or another Group Id, so that they don’t collide. There are several test command providers and the one handling groups is OpenflowpluginGroupTestCommandProvider. Methods, which can be use as commands in OSGI-console have prefix _. Examples for XML for various Group Types can be found in the test-scripts bundle of the plugin code with names g1.xml, g2.xml and g3.xml. If you want to try a different meter id, make sure the URL and the body stay in sync. For example, if you wanted to try: meter-id 20 you’d change the URL to “http://:8080/restconf/config/opendaylight-inventory:nodes/node/openflow:1/meter/20” but you would also need to update the 20 in the body to match. :Provide the IP Address of the machine on which the controller is running. Note: :Provide the IP Address of the machine on which the controller is running. Currently, the openflowplugin has a test-provider that allows you to push various meters through the system from the OSGI command line. Once those meters have been pushed through, you can see them as examples and then use them to see in the config what a particular meter example looks like. Before attempting to PUT a meter you have created via addMeter, please change its URL and body to, for example, use meter 1 instead of meter 2 or another Meter Id, so you don’t collide. There are several test command providers and the one handling Meter is OpenflowpluginMeterTestCommandProvider. Methods, which can be used as commands in OSGI-console have prefix _. Examples: addMeter, modifyMeter and removeMeter. Examples for XML for various Meter Types can be found in the test-scripts bundle of the plugin code with names m1.xml, m2.xml and m3.xml. This page contains high level detail about the statistics collection mechanism in new OpenFlow plugin. Statistics related YANG models, service APIs and notification interfaces are defined in the MD-SAL. Service APIs (RPCs) defined in yang models are implemented by OpenFlow plugin. Notification interfaces are wired up by OpenFlow plugin to MD-SAL. Statistics Manager Module: This module use service APIs implemented by OpenFlow plugin to send statistics requests to all the connected OpenFlow enabled nodes. Module also implements notification interfaces to receive statistics response from nodes. Once it receives statistics response, it augment all the statistics data to the relevant element of the node (like node-connector, flow, table,group, meter) and store it in MD-SAL operational data store. Current implementation collects above mentioned statistics (except 10-14) at a periodic interval of 15 seconds. Statistics mentioned in 10 to 14 are only fetched when any node connects to the controller because these statistics are just static details about the respective elements. Whenever any new element is added to node (like flow, group, meter, queue) it sends statistics request immediately to fetch the latest statistics and store it in the operational data store. Whenever any element is deleted from the node, it immediately remove the relevant statistics from operational data store. Statistics data are augmented to their respective element stored in the configuration data store. E.g Controller installed flows are stored in configuration data store. Whenever Statistics Manager receive statistics data related to these flow, it search the corresponding flow in the configuration data store and augment statistics in the corresponding location in operational data store. Similar approach is used for other elements of the node. Statistics Manager stores flow statistics as an unaccounted flow statistics in operational data store if there is no corresponding flow exist in configuration data store. ID format of unaccounted flow statistics is as follows - [#UF$TABLE**Unaccounted-flow-count - e.g #UF$TABLE*2*1]. All the unaccounted flows will be cleaned up periodically after every two cycle of flow statistics collection, given that there is no update for these flows in the last two cycles. Statistics Manager only entertains statistics response for the request sent by itself. User can write its own statistics collector using the statistics service APIs and notification defined in yang models, it won’t effect the functioning of Statistics Manager. OpenFlow 1.0 don’t have concept of Meter and Group, so Statistics Manager don’t send any group & meter related statistics request to OpenFlow 1.0 enabled switch. For more details and queuries, please send mail to openflowplugin-dev@lists.opendaylight.org or avishnoi@in.ibm.com If you want to report any bug in statistics collection, please use bugzilla. In the Hydrogen & Helium release, the current Web UI does not support the new OpenFlow 1.3 constructs such as groups, meters, new fields in the flows, multiple flow tables, etc. The following is not exactly CLI - just a set of test commands which can be executed on the OSGI console testing various features in OpenFlow 1.3 spec. Point your mininet to the controller by giving the parameters –controller=remote,ip=. Where # is a number between 1 and 80 and openflow:1 is the of the switch. This will create one of 80 possible flows. You can confirm that they were created on the switch. where # is a number between 1 and 80 and openflow:1 is the of the switch. The flow to be deleted should have same flowid and Nodeid as used for flow add. Where # is a number between 1 and 4 for grouptype(g#) and 1 and 28 for actiontype(a#). You can confirm that they were created on the switch. Where # is a number between 1 and 4 for grouptype(g#) and 1 and 28 for actiontype(a#). GroupId should be same as that used for adding the flow. You can confirm that it was removed from the switch. Where # is a number between 1 and 4 for grouptype(g#) and 1 and 28 for actiontype(a#). GroupId should be same as that used for adding the flow. You can confirm that it was modified on the switch. You can now confirm that meter has been created on the switch. The CLI takes care of using the same meterId and nodeId as used for meter add. You can confirm that it was removed from the switch. The CLI takes care of using the same meterId and nodeId as used for meter add. You can confirm that it was modified on the switch. Currently, the openflowplugin has a test-provider that allows you to get notifications for the topology related events like Link-Discovered , Link-Removed events. Point your mininet to the controller by giving the parameters –controller=remote,ip=. Once the controller is connected to the switch, Link-Discovered event can be tested by initially configuring the specific flows on the switch. For Link Discovered event either table-miss flow or LLDP ether-type flow can be configured. as per this OpenDaylight_OpenFlow_Plugin:Test_Provider#Flows_:_Test_Provider[link]. fTM is the table-miss scenario here. Once the table-miss flow is configured through above command, we can see the Link-Discovered event in the debug logs on the controller console. You can confirm that they were created on the switch. Once the LLDP ether-type flow is configured through above command, we can see the Link-Discovered event in the debug logs on the controller console. The flow examples on this page are tested to work with OVS. Make sure that the Table-# and Flow-# in the URL and in the XML match. The format of the flow-programming XML is determined by by the grouping flow in the opendaylight-flow-types yang model: MISSING LINK. The format of the XML that describes OpenFlow matches is determined by the opendaylight-match-types yang model: . The format of the XML that describes OpenFlow actions is determined by the opendaylight-action-types yang model: .